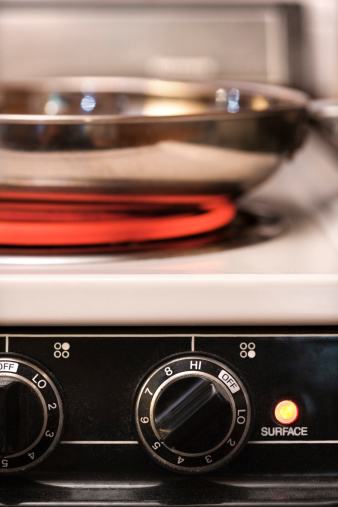 Unlike gas ovens, which provide heat using an open flame, electric ovens produce cooking heat using metal heating elements. Electric ovens offer many cycles, including baking, broiling, convection and-self clean. Most new electric ovens have a digital control panel that starts the oven and regulates the temperature. Prior to using your oven for the first time, it is important to understand the proper way to turn it on so that your food is properly cooked. Electric ovens with digital controls are started using the temperature knob. Press the oven cycle pad on the control panel that you would like to use. For example, press "Bake," "Broil," "Convection" or "Self-Clean." Press the "Up" and "Down" or "+" and "-" pads to select the temperature. If broiling or self-cleaning, use these pads to choose from the broil options of "High" or "Low," and to choose the length of the clean cycle. If your oven has a numeric keypad, enter the desired temperature using the keypad. Press the "Start" button to begin the pre-heating cycle. The oven will emit an audible signal after the oven has reached the desired temperature.